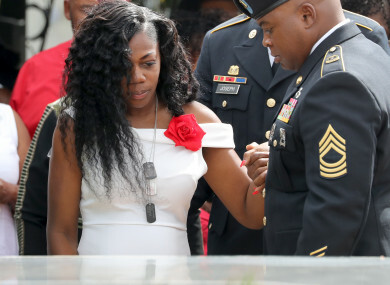 Myeshia Johnson, the wife of Army Sergeant La David Johnson, looks down at his casket during his burial at Fred Hunter's Hollywood Memorial Gardens in Hollywood, Florida. THE PREGNANT WIDOW of a fallen US soldier contradicted President Donald Trump’s account of his phone call about her husband’s death and said what he told her “made me cry even worse”. Myeshia Johnson told ABC’s “Good Morning America” in an interview that Democratic Representative Frederica Wilson was practically a member of their family and was among a group of people listening to Trump’s call on a speaker phone as they drove to receive Sergeant La David Johnson’s body. “The president said that he knew what he signed up for but it hurts anyway,” Johnson said. “And it made me cry because I was very angry at the tone of his voice and how he said it. He couldn’t remember my husband’s name. “The only way he could remember my husband’s name was he told me he had my husband’s report in front of him and that’s when he actually said La David. Whatever M Wilson said was not fabricated,” Johnson said in her first interview since her husband’s death. What she said was 100% correct. Sergeant Johnson and three comrades died on 4 October in Africa when militants tied to the Islamic State attacked them. “I need to see him so I will know that that is my husband,” she said. “They won’t show me a finger, a hand. I know my husband’s body from head to toe. And they won’t let me see anything. I don’t know what’s in that box. It could be empty for all I know. But I need to see my husband. I haven’t seen him since he came home. Trump took to Twitter following the interview to say that he had a “very respectful” conversation with Johnson and that he had “spoke his name from the beginning”. Last week Trump tweeted that Wilson “fabricated” his statement and the fight escalated through the week. Trump in other tweets called her “wacky” and accused her of “SECRETLY” listening to the phone call. Asked if she had anything to say to Trump now, Johnson said, “No, I don’t have nothing to say to him”. Wilson has been a friend of the Johnson family for years and Sergeant Johnson was in her 5000 Role Models program that pairs African-American boys with mentors who prepare them for college, vocational school or the military. Johnson said she wants the world to know “how great of a soldier my husband was.” She also said he was “a loving and caring father and husband”. “They told me there was a massive gunfire and that my husband, as of 4 October was missing,” she said. They didn’t know his whereabouts or they didn’t know where he was or where to find him. A couple of days later is when they told me he went from missing to killed in action. Email “Pregnant widow of killed US soldier says phone call from Donald Trump made 'me cry even worse'”. Feedback on “Pregnant widow of killed US soldier says phone call from Donald Trump made 'me cry even worse'”.